­It doesn't really, but one desires to have some means of expressing their support or displeasure in some way, however futile it may be. You do things that don't matter, then tell other people not to do them? ­I've never told anyone not to vote; but I cannot in good conscience allow them to labor under the false delusion that the candidates they are voting for have their best interest at heart. They need to know who's interests the candidates serve. You've made multiple posts about how voting is useless because jews. Are you going to deny that for 12 pages now? ­You seem awfully bothered by what I say and post here. OCD is not pretty to watch. I'm not bothered at all. You seem to be very inconsistent, yet you claim everything you say is 100% truth. ­Truth isn't found in only one direction, it lies scattered about in a thousand different places. Its not your direction that's concerning. Its your inconsistency. One day X is true, the next day X is false. It seems your values are more aligned with preserving your fragile ego than finding truth. ­Appearing consistent to my enemies isn't one of my concerns. Obviously, but you can't expect anyone to believe anything you say as fact if you change your position every day. ­I only appear inconsistent to those who don't see things my way to begin with. That's interesting, because you just admitted to being inconsistent, now you're claiming to be consistent, which itself is inconsistent. 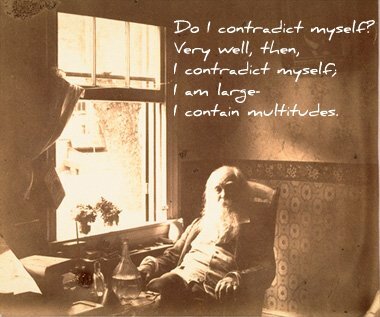 Whitman was a poet. You're trying to sell a an inconsistent philosophy. ­I'm not trying to sell anything. People either see things the way I see them or they don't. Sometimes I just go about disillusioning them of their false beliefs to help them see the truth; but I never have to sell the truth to them; it's there whether they see it or not. I can only say one thing about Akins' mental issues; better him than I. This is called selling a philosophy. Its what you do on a daily basis. You're making the inaccurate assumption that your inconsistent beliefs are true and everyone else's are false, then trying to convince people of this. ­I'm not trying to convince people of anything, but I do enjoy countering lies with the truth. You don't mind that everything you claim is false? Sounds like you're trying to convince me of something. ­No. I'm just responding to your lie with the truth. I don't accept what you say as truth. That's also the prerogative of everyone else who has been subjected to your 20 years of repetitive online nonsense. ­Yes, they all have the prerogative of deciding whether they see things my way or not. Then why post the same things over and over for 20 years?